These machines were inspired by extensive feedback from John Deere customers looking for more productivity, better visibility and simplified service to remain competitive in their businesses. 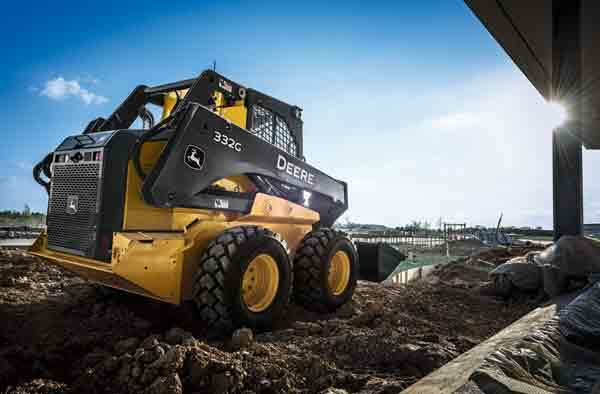 John Deere not only answered by improving in these areas, but also added a host of new features to make the large-frame G-Series machines easier to run and maintain on jobs of every scale. The biggest improvement on the large-frame G-Series is the refined vertical-lift loader boom design that raises higher, reaches farther and lifts more for quicker and easier loading. Height to hinge pin is 11 feet, enabling operators to easily load dump trucks, feed mixers, and fill hoppers and everything in between. Customers will also appreciate the new lift path that extends an additional six inches from the machine. The large frames also serve up substantially greater boom and bucket breakout forces. In fact, they have horsepower that is comparable to a small backhoe or crawler, and they also work comfortably in tight quarters, so operators can accomplish more with less machine. Increased rated operating capacities of up to 3,700 lbs. give these models the muscle needed to master heavy loads, coupled with a breakout force that has been increased by 40 percent to make lifting heavy loads easier. 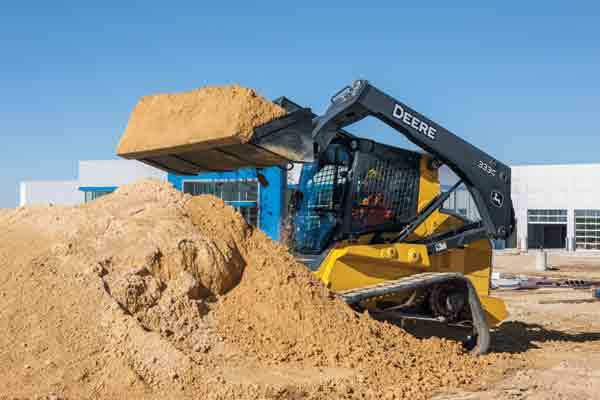 Increased auxiliary hydraulic flow and power on the large frames means customers can make the most of an even broader range of attachments for a wide variety of work. Universal Quik-Tatch™ enables you to go from bucket to forks and more in just seconds. Generous standard and optional high-flow auxiliary hydraulics also let you effortlessly run powered attachments, such as hydraulic hammers, cold planers, mulching heads and trenchers. All auxiliary hydraulic lines and wiring on new machines are now routed through the boom where they’re more protected and out of the operator’s sightline. 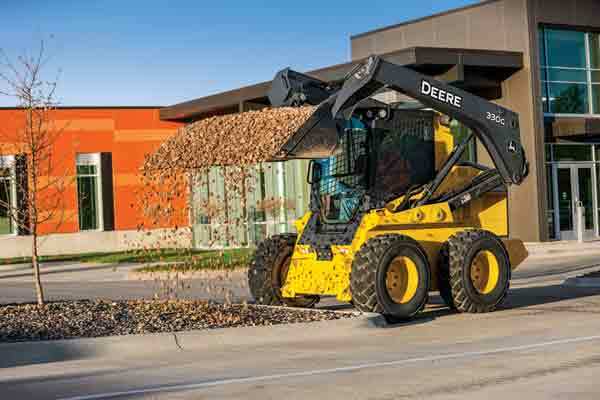 Understanding a comfortable operator is a more productive operator, John Deere made several enhancements to the cab on the large-frame G-Series machines. An easy-access entryway, tightly sealed swing-out door, and ample foot-and legroom simplify getting in, getting comfortable and getting things done. Unobstructed sightlines to the bucket corners, the edge of the tires or tracks, and the job site ahead and behind instill confidence in tight quarters. Best-in-class visibility gets even better with an optional rearview camera that displays the action behind on an upfront monitor and an optional LED lighting package that provides front and side illumination for extended days and after-dark tasks. Consistent with other G-Series models, flexible control choices on the large frames allow contractors to choose between standard EH ISO controls, (EH) ISO joystick controls or options that are switchable between ISO- and H-patterns, or EH 3-way switchable controls that allow operations between ISO- or H-pattern, or hand and foot controls of operation within the same machine. The cabs and floors are sealed and pressurized to keep out dust and excess noise, and a footwell clean-out makes debris management easier than ever, minimizing costly maintenance and downtime. Cab side windows also remove easily for cleaning. 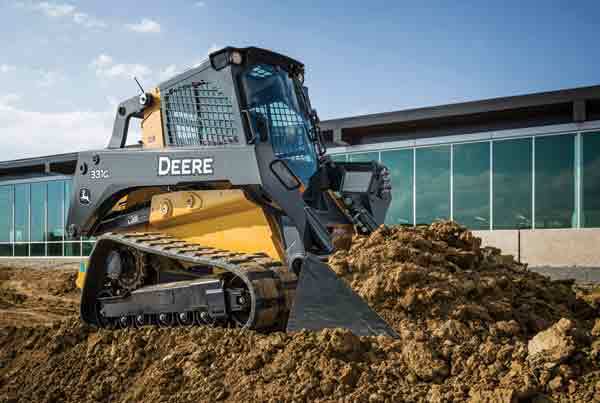 Another key uptime improvement on the G-Series large-frame machines is the integration of John Deere WorkSight, an exclusive suite of telematics solutions that increases uptime while lowering operating costs. At its heart, JDLink Ultimate machine monitoring provides real-time data and health prognostics to suggest maintenance solutions that decrease costly downtime. Remote diagnostics enable a dealer to read codes, record performance data and even update software without a trip to the job site. •	Rated Operating Capacity: 3,000 lb. •	Bucket Breakout Force: 6,000 lb. •	Operating Weight: 8,770 lb. •	Rated Operating Capacity: 3,600 lb. •	Bucket Breakout Force: 7,750 lb. •	Operating Weight: 9,610 lb. •	Rated Operating Capacity: 3,100 lb. •	Operating Weight: 11,900 lb. •	Rated Operating Capacity: 3,700 lb. •	Operating Weight: 12,100 lb.